Aikatsu! 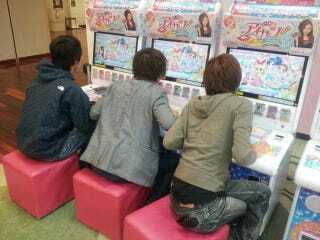 is a popular collectible card arcade game in Japan. The cabinet is smaller, because it's aimed at children—little girls. And yet, there are a handful of grown men who play it. They are not little girls! Not the target audience! And some are hogging the game, preventing children from playing. So mean. Look, if you are an adult—an "Aikatsu Ojisan" ("Aikatsu Old Dude")—and adore the game and are a paying player, that's your prerogative. But c'mon, making kids wait? Or even making other big friends wait, too? There's one way to solve this problem, you know: A console version. Oh wait, there already have been two 3DS games. WE'RE DOOMED.